Kathryn Beasley is the Graduate Recruiter and Retention Coordinator for the College of Engineering. She works with prospective College of Engineering graduate students to ensure a smooth transition into a Master’s or Ph.D. program and also works to encourage student success for currently enrolled College of Engineering students. Beasley graduated from Tarleton State University (Stephenville, TX) with a major in Communications and a minor in Technical Writing. While a student, she worked for the campus radio station and enjoyed being involved in campus organizations and the community. After graduation, Beasley worked for over four years in the undergraduate recruiting office at Tarleton where she enjoyed traveling around the State of Texas meeting students and their families and promoting higher education. 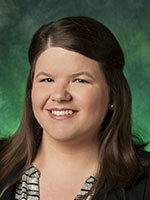 Education is a passion for Kathryn, and beginning in Fall of 2012, she planed to pursue her goal of earning a Master’s degree from UNT. She achieved her goal in 2016.